Cynthia Cranes Art and Gardening Goodness: GROW YOUR BLOG WINNER and a RECIPE CARD for All! GROW YOUR BLOG WINNER and a RECIPE CARD for All! You can see from Jan's blog that she's a talented quilter and photographer, drawing inspiration from all those precious animals on her farm in the North Georgia Mountains! 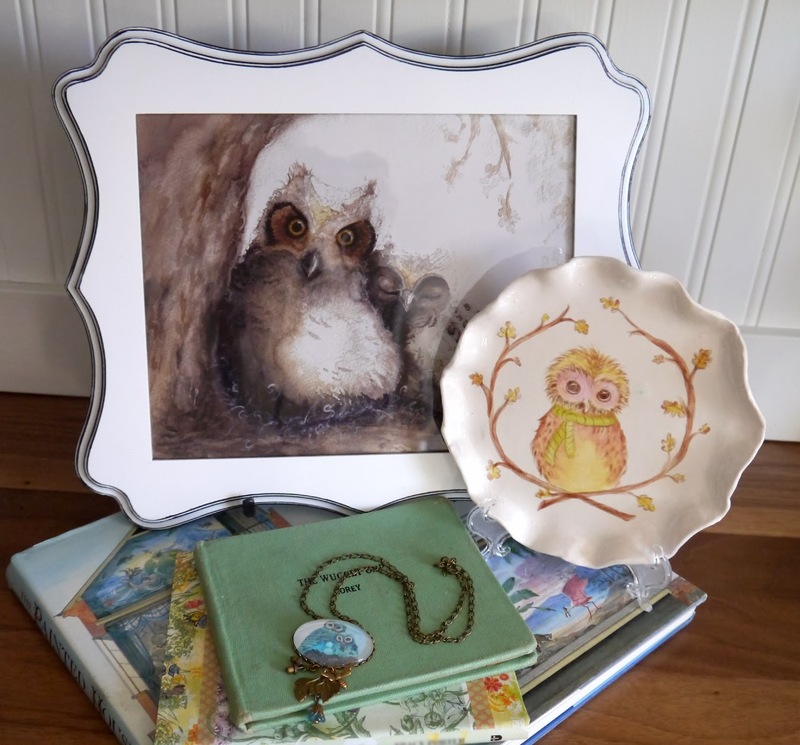 I hope you adore owls Jan, because you are the lucky of winner of the above collection of owl art from my Etsy Shops! I am so very grateful to each and every one of you that stopped by to visit, comment and/or join my blog, and most especially to Vicki from 2 Bags Full for hosting this wonderful event! This was a new and very special opportunity for me to make connections with so many kindred spirits in the blogging community. But I have a lot of catching up to do in the days ahead, because OF ALL THINGS! right after the party launched my computer crashed and I've had very limited access to the web for over 2 weeks! Nor could I make a February Desktop Calender since I also lost my PhotoShop program. But for the time being, I'm using an alternative program that, although adequate, in no way compares. I did, however, manage to create this yummy printable recipe card featuring my watercolor painting of mama bear with her first cup of tasty brew after a long winter's nap! Just click the image and download to your computer. Print on cardstock using landscape setting. A gift of this delicious creamer packaged in a mason jar along with the printed card is a fun way to let a friend know that she's a special ingredient in your life! Yay! I am so excited. Sending you my address through email. I love your work! Thank you and good luck with your computer! Thank you so much Cynthia for sharing your printable recipe card with us. It is precious! Congrats to the winner and my fingers are crossed that your computer works for you!!!! Congrats Jan looks like lovely gifts. Hope the computer gets you back up and running again for your art and goodies are wonderful to enjoy for all to see. I came over for a visit from Sew and Sow Farm's blog. You have beautiful artwork! Congrats to Jan for winning! I'm off to print your recipe card. Thank you for sharing it with us. Have a great day! Congrats to Jan and, in fact, I am visiting here from her blog!! I've signed up as a follower via email. I love my MacBook Air so good luck with your new iMac!! Came over to visit from Sew and Sow's blog. Have a great day. I love love love owls and you are so good at painting them! So glad I found your blog.